The protest comes as Theresa May’s government in London inched forward once again towards the cliff-edge of a crash Brexit. Repeatedly defeated by her own MPs on a deal to withdraw from Europe, May has failed to identify any other option after almost three years of negotiations. An additional period of two weeks for a deal to be approved was agreed this week by EU leaders after May had sought an extension to the March 29 deadline. The European Council also allowed for a preparation period for a crash Brexit until only May 22, avoiding the possibility of Britain and the north of Ireland taking part in European Parliament elections. A clear message was sent by the estimated one million people marched on Westminster today. The ‘Put it to the People’ demonstration called on the London parliament to give voters in Britain the right to say ‘yes’ or ‘no’ to whatever deal MPs finally come up with on Brexit. 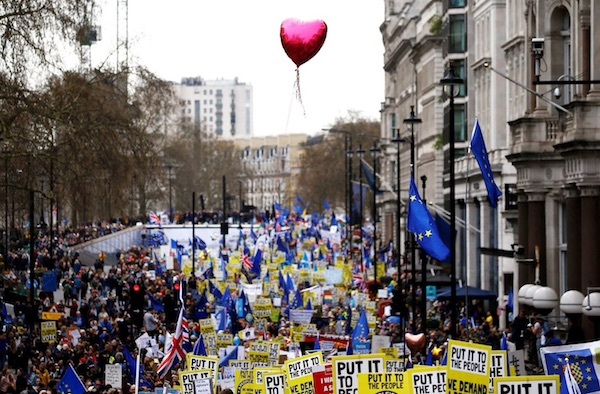 The huge march was even bigger than the previous demonstration organised by the grassroots People’s Vote campaign back in October 2018, which was attended by around 700,000 people. Demonstrators wore blue and yellow berets and flew large EU flags above the crowd as the march slowly made its way to Parliament Square. Placards bore messages urging the Tories to “revoke article 50” and for Brexit to be put to the people. Meanwhile, a petition site operated by the British government hit a record of 4.5 million signatories calling for the Brexit process to be suspended. The scale of the crisis facing Britain and Ireland was made clear this week when it emerged plans were advanced to house a Brexit military operations center in a reinforced concrete bunker in the Whitehall area of London. Meanwhile, the leaders of British business and labor unions set aside their differences to make a joint appeal to Theresa May to change course or risk an economic disaster. Top officials at the Confederation of British Industry and the Trades Union Congress said Thursday that Britain faces a “national emergency” if Tory racists and unionist hardliners succeed in pulling Britain, and the north of Ireland, out of the EU without a trade deal. Reports suggested European leaders were bewildered at Mrs May’s unwillingness to set out her plans should she fail to win support of Westminster MPs for the deal this week, at a third time of asking, despite evidence that she could be landed with an even larger defeat than last time. Meanwhile, Border Communities against Brexit are going ahead with a major anti-Brexit protest for various points on the border through Ireland on Saturday March 30th at 3:00pm. These mobilisations will take place at border crossings at: Old Dublin Road, Carrickcarnon; Belcoo-Blacklion; Aghalane; Moybridge, Aughnacloy; Lifford Bridge; and Bridgend. “We are asking everyone living along the border, on either side, to make an effort to attend their nearest demonstration,” they said in a Facebook post. “We are calling on all trade unions, representative groups, civic leaders and citizens to join with us in demonstrating our anger at being taken out of the EU and our opposition to any return to a hard border in Ireland. “We will be sending to a very clear message that the people of the border region and, indeed, the people of Ireland will not acquiesce in any construction of new border installations, Customs posts or on any restriction of movement in their own country.